Taking its formal step into the green industry at 2016 GIE+EXPO, Libertyville-Ill.-based outdoor power equipment manufacturer Yardmax showcased a Power Wheelbarrow, log splitters and a plate compactor ideal for landscape contractors. Powered by a Briggs & Stratton engine, the 350-pound Power Wheelbarrow is designed for working in small spaces, with a 4.4 cubic foot hopper capacity. Equipped with all-wheel drive and zero-turn radius, the wheelbarrow has a multispeed transmission—three forward speeds, plus reverse. Comprising Yardmax’s log splitter lineup is the two-way gas full beam log splitter, available in four sizes; the two-way gas half beam log splitter, a more compact version of the full beam splitter that requires one-person assembly and is available in four sizes; and the 5-Ton electric log splitter. The plate compactors, according to Yardmax, create optimal density for the foundation of basic paving projects, reducing erosion and delivering extended durability. 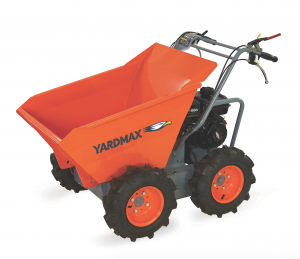 Yardmax products come standard with safety shields, pre-assembled motors, log cradles, pre-filled hydraulic oil and heated hand grips and a 90-day commercial warranty.